I’ve been looking up a few robots lately. There are a lot of impressive kits out there, and many of them pass as toys for kids, even if the technology included would have impressed researches 10 to 15 years ago. First out, the Pololu 3pi line following wheeled robot. It’s based on an ATmega328 chip, and can be programmed like an Arudino. It has five reflectance sensors to detect a line beneath its front, and two motors to control speed and direction. An Arudino library makes programming easy. It’s $100 from SparkFun. 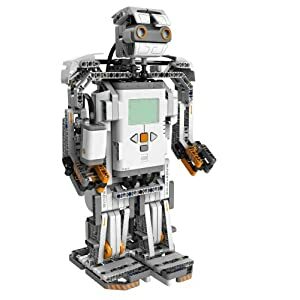 Next, the Lego MindStorms NXT 2.0, a Humanoid with an impressive selection of sensors, including ultrasonic distance sensor, light, and colour. 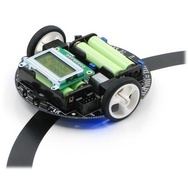 It is controlled by a 8-bit Renesas H8/300 micro controller, and can communicate over Bluetooth or USB. The programming environment is tailored towards kids, using a GUI box interface. However, most other major programming languages can also be used through third party compilers. As usual with Lego kits, the parts can be used to build other models as well. Instructions for four different robots are included, and your imagination is the limit to what other things you can build. At $280 from Amazon, this seems like very good value for money. 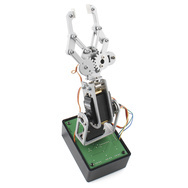 Over at Active Robots, they have several toys and kits, including the walking Penguin Robot, based on the BASIC Stamp 2px24 micro controller. Although a bit clunky, it looks fun. And at £150, it sounds like a good intermediate kit. However, on the high end, Active Robots stock the Hitec Robotics ROBONOVA-I. This looks like the king of hobby robots, with 16 servos controlling arms and legs. It’s based on the ATMEL ATMega 128 micro controller (aka Arduino Mega), with several optional sensor like “gyros, acceleration sensors, speech synthesis modules and operational devices such as Bluetooth controllers and R/C transmitters and receivers”. It comes at a stiff price though; at almost £600, or 700 Euros, it’s for serious hobbyists, and not Johnny’s xmas present. Make sure you check out the robot football game, and other corny moves on its home page. Also have a look at Active Robots other robot links; plenty of interesting material to browser through.